What is the FME ArcGIS Server Edition? FME ArcGIS Server Edition is a product sold by Safe Software to add FME formats and tools to services run by ArcGIS for Server. The normal workflow involves using the FME Desktop extension for ArcGIS Desktop to author workflows which are then published to ArcGIS Server. On the ArcGIS Server machine the FME ArcGIS Server Edition is installed and licensed allowing services containing FME tools to run in the server environment. Map Services or Geoprocessing Services with FME tools are created in ArcGIS for Desktop using the FME Extension for ArcGIS. This extension can be enabled by installing FME Desktop (FME ESRI Edition or higher) and using the FME Integration Console to extend FME into ArcGIS. Maps or Geoprocessing tools with FME components are then created and published to ArcGIS for Server. 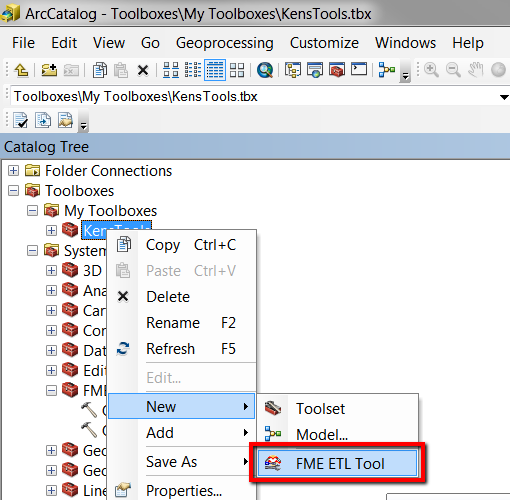 To allow ArcGIS for Server to run services which use FME formats or tools you must extend ArcGIS for Server by installing FME Desktop with the FME ArcGIS Server Edition license on the machine running ArcGIS for Server. Please also note that ArcGIS for Server version 10.1 or later is a 64 Bit application and therefore a 64 bit FME must be installed to extend ArcGIS for Server. 1. 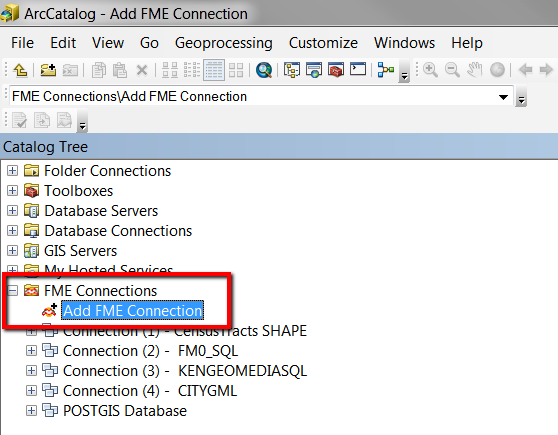 In ArcCatalog create an FME Connection to your data by expanding FME Connnections and double clicking on Add FME Connection. Fill in your parameters to connect to your source data and browse the data in ArcCatalog. 2. 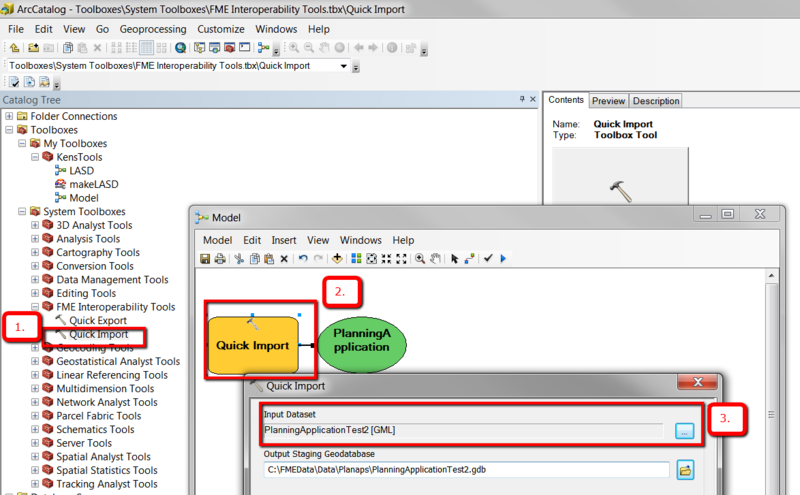 From the ToolBox expand FME Interoperability Tools and drag a Quick Import or Quick Export tool into your model. 3. Double click on the tool to set the connection parameters either for your Input Dataset (Quick Import) or your Output dataset (Quick Export). 4. Run the model in ArcGIS Desktop to test and then right-click on the success message in the Results tab to "Share As" - "Geoprocessing Service". Be sure any source data is accessible on the ArcGIS Server machine. 2. The new workspace wizard will appear and allow you to define source and destination datasets before starting FME Workbench. Once FME Workbench starts you can then edit your workspace to include any FME workflow. Save the ETL tool and rename it in the Toolbox appropriately. 1. Disable background disable background processing for Geo-processing tasks. 3. Ensure and data or directories accessed by the ETL tool are accessible on the ArcGIS Server machine you are publishing to. 3. Right-click on the success message in the Results tab to "Share As" - "Geoprocessing Service". ArcGIS has now some description category which are mandatory as of ArcGIS 10.1 which you may need to fill in before publishing the tool. 1. A log file created by an ETL tool which may help you see why an ETL tool did not run and this log file should be available here: C:\Users\\AppData\Local\Safe Software\Interoperability\logs 2. If you are running ArcGIS Server 10.1 ensure you have installed a 64 bit version of FME Version 2012 SP3 or later. 3. ensure that any formats used in your FME ETL tool are available on 64 bit FME, you can confirm that using Search by Plaform on the formats web page on our website. Are there any limitations when working with FME 64-bit and ArcGIS Server 10.1?